Hey! What the hell is HE doing here???? Stevo is on the front page of the China Daily this morning – both on-line and the hard copy… The Harperites have apparently come to the conclusion that it is best not to piss off the world’s largest growing economy. I don’t really expect anything surprising to come from this. There will be the usual shaking of hands, photo ops with top Chinese officials and the signing of a few trade deals. But the real significance will be in how the Chinese leadership interprets this trip. Is it mostly political posturing (You betcha! The ReformCons are targeting those Asian-rich 905 ridings in the GTA and the ethnically similar ridings in and around Vancouver) or is it a real attempt to mend some fences and move forward? I wonder if I’ll get invited to have dinner with him tonight? I’ll have to decline though since a “hot pot” is on the agenda. As my journey to China is nearing it’s end (I fly out on Friday evening and land early Saturday morning) I thought it would be a nice distraction to go over some of the thumbs-up and thumbs down about my visit to the Middle Kingdom. It would be repetitious to go over the obvious, such as the trip to the Great Wall or the Forbidden City cuz they were just, uh, thumbs through the stratosphere! THE FOOD! An amazing array of epicurean delights around every turn. The quality and variety is unlike anything I have experienced. I counted the number of dishes that our gracious dinner hosts had brought to the table last night and there were 14! 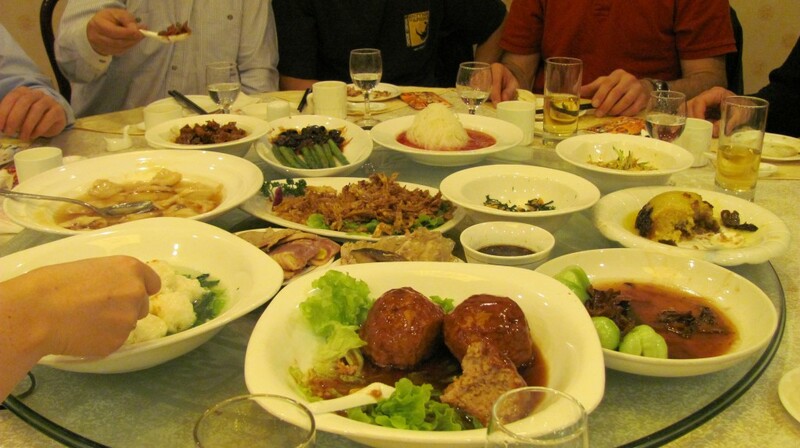 Even better, the cost is very palatable – I have not yet spent more than 110 Yuan for dinner – about $20.. and that includes beer! 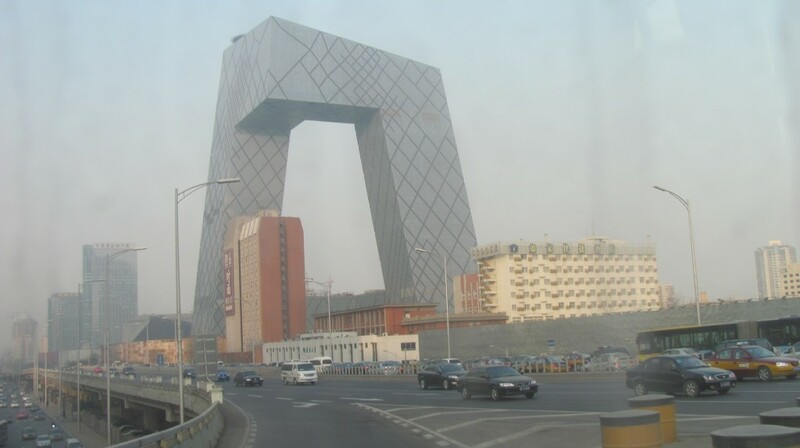 While I am not normally a big fan of over-the-top extravagance, the sheer size of everything in Beijing – whether it be the massive glass and steel office towers or the breadth of the Soviet-style streets – all are on a grandiose scale that bespeaks the importance of image to the Chinese. The ever-present smog (or should I say “fog” as the Chinese don’t have specific word for that layer of fine particulate that hangs over the city like a fluffy pillow. On one day, the visibility was about 200 metres, the smell was acrid and everyone was coughing. About one in ten Beijingites (um, that doesn’t sound right) wear face masks to provide some measure of protection from the gunk in the air. A nice little side industry has sprung up in the custom face mask area… some very chic designs. Again lung-related – the smoking is driving me crazy! I have not had to use my puffer so much since I quit the damned addiction 5 and a half years ago! You cannot get away from it – restaurants, washrooms, hallways – smokers are everywhere! The traffic is both a thumbs-up and a thumbs-down. While it is entertaining to watch pedestrians try to cross one of the broad boulevards while dodging cars, busses, rickshaws, bikes and trucks, being one of those pedestrians is downright scary! You think Montreal is bad? HA! But really even the not-so-great things are not really that important and are FAR outweighed by the magnificence that is all around. From the crazy xmas decorations (I thought they were atheists here!) to the knee-slapping attempts at translating English from Chinese (I think I’ll do a photo post on this), this is most definitely a different world. 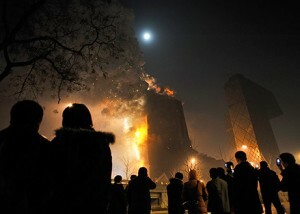 Some of you may remember a massive fire that happened here in Beijing a while back. 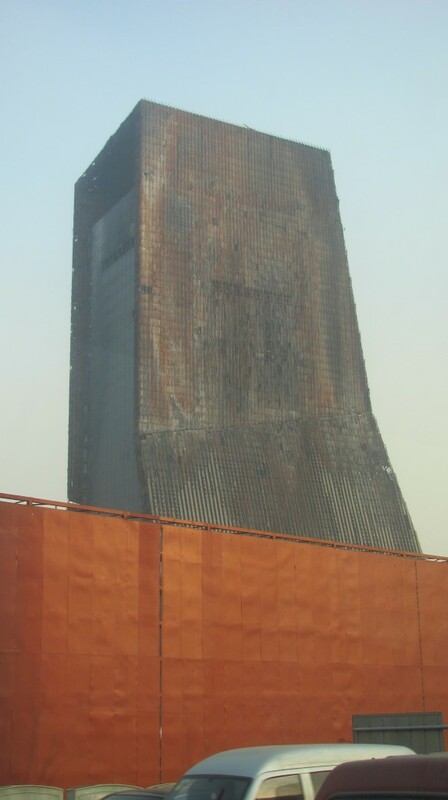 This is the result… look out Towering Inferno! Food is real important to the Chinese. Here is the spread at last night’s dinner – graciously hosted by our interpreters and their friends. 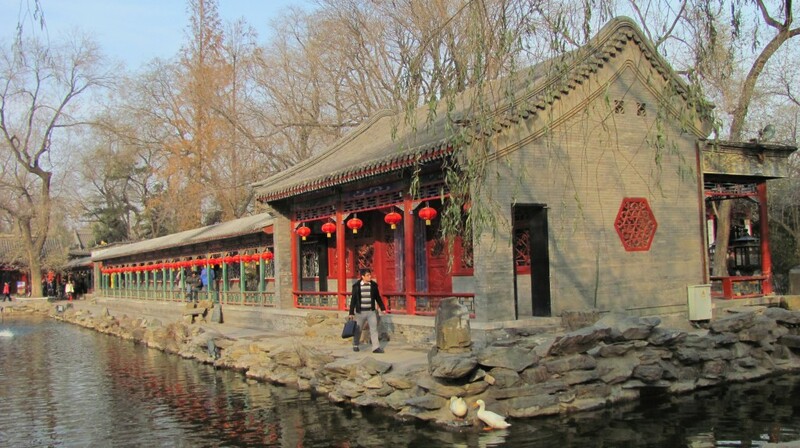 We were whisked in a brand new Land Rover to the south end of the city to one of the world’s finest Peking Duck establishments . That reminds me of a funny thing our Great Wall guide told us the other day. In China, in order to marry a good woman from a good family, one must have two sets of keys – one to a house and one for a car. Our hosts also treated us to a tour of a mansion in the heart of the city. Beautiful.